Dark red wool flannel vest with rolled collar, zipper and patent-leather belt and knickerbockers; white wool sweater. 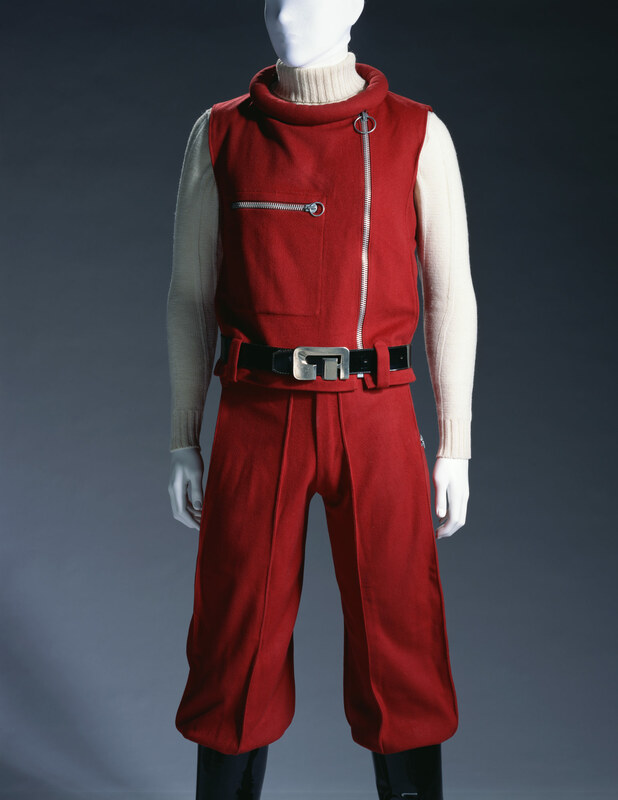 This men's outfit by Pierre Cardin represents the 1960s' design, so-called the "unisex" concept. The front design with zippers was a step toward eliminating differences in style between the sexes. Cardin, born in Italy, moved to France in 1924. After learning tailors' techniques, he studied Haute Couture, and founded his Haute Couture house in 1953. With an excellent ability to quickly identify underlying needs of the times, Cardin started a full-scale prêt-a-porter business in 1959. In 1960 he went into the men's clothes market, which had been monopolized by tailors except for casual wear. Cardin could foresee the "unisex" trend, and suggested a fashionable line of men's clothing by utilizing his techniques as tailor.